Syllabus of the Online Course (Subject): Action Plan for Boosting Intra-African Trade. 1- Introduction to Intra-African Trade. 2- Action Plan for Boosting Intra-African Trade (Economic Commission for Africa / African Union). Description of the Online Course: Action Plan for Boosting Intra-African Trade. The main objective of the Action Plan for Boosting Intra-African trade is to reach 25% of intra-African trade (currently, is 10% - 13%) through regional integration. Although African products have a competitive cost “in factory (EXW)” but distribution process in Africa (transport, handling, customs, and storage) increases the final price and therefore they generate a loss of competitiveness. One of the troubles of intra-African trade is the long delay of Customs in Africa (12 days), to high compared by example with Central Asia (6 days). Near 80% of African exports are exported out of Africa. 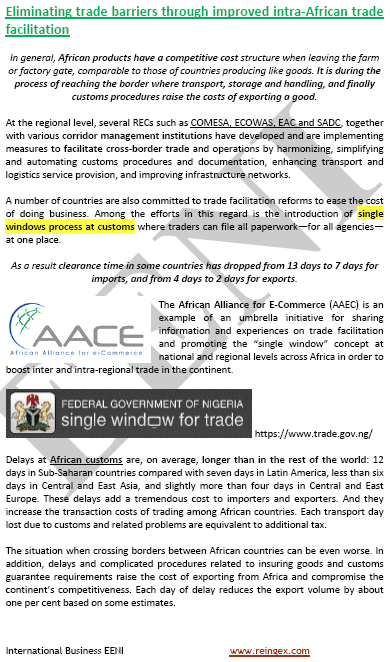 The development of National Single Windows is a key factor to improve intra-African trade. Regional Economic Communities (REC), like COMESA (Common Market for Eastern and Southern Africa), EAC (East African Community), SADC (Southern African Development Community), IGAD (Intergovernmental Authority on Development), ECOWAS (Economic Community of West African States), CEN-SAD, ECCAS (Economic Community of Central African States) or the Arab Maghreb Union are the key pillar of this vision according to the Treaty of Abuja (the African Economic Community). Regional Economic Communities are working in free-trade areas, customs union, common markets and economic and monetary unions. Economic Commission for Africa and African Union are the promoters of this ambitious plan. COMESA-EAC-SADC Tripartite Agreement or Organisation for the Harmonisation of Business Law in Africa (OHADA) are good examples of the regional integration in Africa that can boost the intra-African trade. Today, Africa only represent the 3% of the global trade. China, India, European Union, and the United States (African Growth and Opportunity Act (AGOA) programme) are the top partners of Africa.